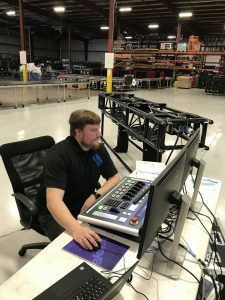 Leading North American Lighting and Video rental specialist 4Wall Entertainment has invested in new Kinesys automation equipment with the purchase of 36 x Elevation vari-speed chain hoists, 36 x LibraCELL load monitoring shackles, two K2 control consoles and numerous Kinesys Vector control systems. This substantial purchase is for general stock and reflects the growing trend and demand for automation systems as part of shows, events, touring lighting and video systems as well as set element motion. 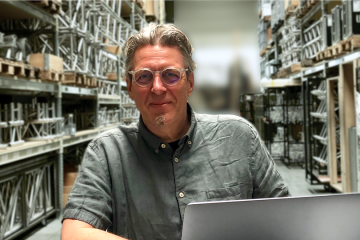 The decision to go with Kinesys was made by Brett Puwalski, Vice President of Operations, a key catalyst in this move to boost the automation resources available for 4Wall’s diverse roster of clients. Kinesys was selected because the brand has a “great track record for reliability and service, and due to its longevity in this specialist area. Kinesys has proved time and again that it is rock solid” stated Brett. 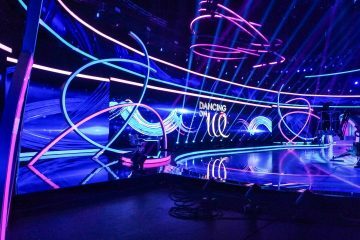 “The current generation of visual and production designers use automation to move both lighting and video elements to WOW audiences and create amazing drama and stunning stage environments” he added, highlighting how video, in particular, has become a huge part of so many production designs in the last decade. The decision to invest in both of Kinesys’ powerful and intuitive control options was also for maximum flexibility. The K2 console is a self-contained hardware solution produced by Kinesys that includes a PC optimised to run the K2 software for the best possible user experience. It allows faster programming and easier operation with an intuitive approach, as well as dedicated buttons and playbacks. There’s also an inbuilt Emergency stop (ES) and Dead Person’s Handle for connection to an ES system, such as Kinesys’ own Array PD-ES. The operator can ‘click-and-drag’ objects around the K2 screen that outputs a 3D graphical representation of space rather than typing positions into a table, which gives instant feedback as to the object’s position in relation to other moving items. 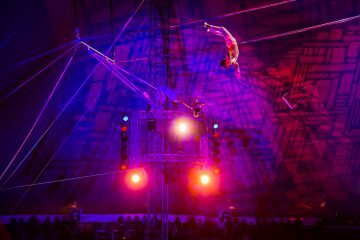 “For K2 projects this gives us an amazing amount of accuracy with the hoists. We were all impressed with the 3D visualisation” said Brett. 4Wall’s crew received training at Kinesys’ Atlanta facility at the end of last year and again in 2019, and their general feedback has been that the kit is safe, dependable, easy to install, programme and use – all aspects that are key to a smooth tour. The first project for the new 4Wall Kinesys kit was an iHeartRadio ALTer Ego 19 event at The Forum in Los Angeles featuring performances by Twenty One Pilots, The Killers, Muse, Weezer, Rise Against and others. 4Wall’s new Roe LED video product was moved, ‘Guillotine style’ over the turntable stage. As each act finished their set, the stage revolved around, revealing the next act already set up and ready to go. The Kinesys system will mainly be kept at 4Wall’s Lititz, Pennsylvania shop when it is off the road and will be available wherever needed.